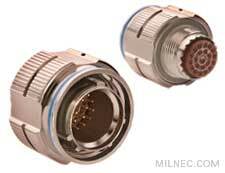 The D38999/26 straight plug mates with MIL-DTL-38999 Series III receptacles and meets all NASA specifications for spaceflight applications. It features a ratchet coupling ring with self-locking teeth that prevent disconnection in high-vibration environments. A strain relief backshell is required, and a protective cover is recommended to protect the connector and contacts when it is not mated.